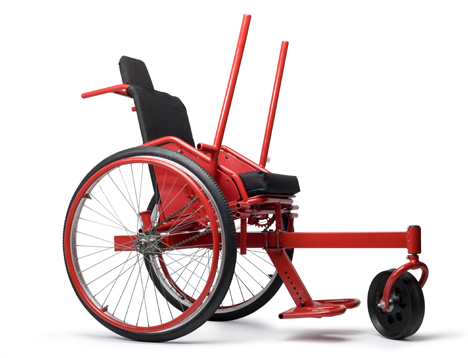 Amos Winter’s LFC, or Leveraged Freedom Chair, is a wheelchair for the developing world. It’s designed for off-road use as well as for speeding along the odd good, flat road, and because it is built from bicycle parts, it can be repaired anywhere that bikes can be repaired, which is pretty much the entire world. In fact, its simple design means that it can actually be made by anyone with a few spare parts and some welding gear. First, it’s long, and therefore stable on hills and other rough-terrain. And because not even a strong, able-bodied person would want to push themselves and a heavy steel chair up a bumpy slope, it has “gears”. Those two long levers are what drives the chairs, via bike chains and freewheels (both sides are independent, to allow steering). Grab low down the levers and you can get up some speed. When the going gets harder, you grab the tops of the levers and use the mechanical advantage they provide to shift down and power up hills. The LFC has undergone tests, and is starting a pre-production clinical trial right now in India. Hopefully that will go well, but this story really shows the importance of communication in the developing world. If you show a photo of this chair to anyone with a workshop, anywhere in the world, and they would be able to start building it right away.